Japanese cuisine hardly ever appears on this blog, which does not mean I am not facinated by it. I don't know half as much about it as I would like, so I was intrigued when Jason of Pursuing my passions dropped me a line to tell me about tomorrow's Konnayaku-day blogging event. If you, unlike me, know perfectly well what konnayaku is, then you might like to use this chance and join Jason with your favourite recipe. For me and all those who are not afraid to declare their ignorance, it is a great chance to head back to Jason's blog and learn something new. If you, like me, are one of those who follow the Italian food blogging scene you might have already stumbled on Gambero Rosso's new blogs, including the revamped Papero Giallo written by Stefano Bonilli, co-editor in chief of the GR magazine. The new blogs added are Marco Bolasco's In punta di forchetta; In vetrina, by Emanuela Comignani (about food related shopping? ); Dire Fare Mangiare, dedicated to GR's upcoming same named gastronomic convention, and edited by Luciana Squadrilli and Matteo Simonini; and Cosa succede in città by Nerina di Nunzio about the events taking place inside the space of GR's multimedial gastronomic complex Città del gusto. For the lazy ones like me who don't want to browse through all the blogs, there's even a so called social space collecting all the newest post of the various blogs. Congratulations to Gambero Rosso for the much awaited (and needed) new look and good luck for the start of the new blogs. In case you haven't visited the IMBB? website recently you might have missed the website's cool new looks. But that's not all, Ronald has added a great event notification feature that will keep you posted an all the food blogging events out there. What are you waiting for? Go on and subscribe! Event: Il Blog si mangia? - Professor Gino Roncaglia, who counts the book Il mondo digitale. Introduzione ai nuovi media (The digital world. An introduction to new media) among his works. - Mario Tedeschini Lalli, Journalist and author of the blog Giornalismo d'altri. - And last but I hope not least, yours truly, in audio connection from Germany. I cannot help observing, I'm the only real food blogger in the bunch of serious experts, so I'll have to do my very best to represent the category. If you're in Rome and would like to attend to the event it is free (and there will even be a little taste of pizza, which is more than what I will get ;-) ), but the number of places limited so just write an email to marketing@gamberorosso.it to secure a place. The roundtable will take place in Gambero Rosso's food gastronomic "citadel" Città del Gusto starting at 6 PM. "See" you there! I had almost lost hope for Italian food blogs. For more than a year now, the number of enjoyable food blogs in Italy could be counted on the fingers of a hand... of a clumsy one eyed lumberjack. My own decision to post in English came mainly from the hope to communicate and get in touch with people around the world, yet a part of it also came from the less than encouraging situation of food blogs in Italy. Had it not been for Ronald and Katia's Via Ritiro no.7 Diary and Carlo's My latest supper, both in English, I would have felt rally alone. With just under 1000 km spent behind the wheel, here I am back from my Italian culinary experience. It has been a ten day eating and cooking marathon. I'm definitely lacking sleep, but I really don't care: I had the time of my life. I've met with some great people, eaten in one or two nice places, spent a week covered in fish scales, guts and the like in the kitchen of La Locanda della Tamerice working together with Igles Corelli, one of Italy's most experienced chefs, and his very professional and friendly brigade. In the next few days I'll be posting my Emilia Romagna adventure, with reviews, posts on products, books, and the like. 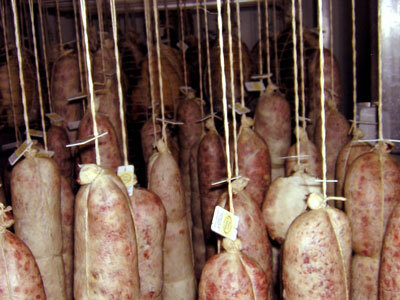 The opening picture, salami gentili made by Ore, is just a preview of things to come. The food blog brigade's typical serving comes with a dash of passion, a dollop of honesty and half a pound of humour. P.S. I'm told the article ran in the printed Lifestyle section of The Guardian, accompanied by a picture of Britain's culinary mother-figure Delia Smith and the following legend: "Move over Delia". Funny, especially since I find Delia terribly boring, but it still sounds a bit blasphemous. So yeah, right, move over, and while you're at it hand Norwich City FC down to those sport bloggers. Bloggies, last chance to vote. If you wanted to vote for the Bloggies and haven't done so yet, this is your last chance. Voting will close at 10:00 PM EST on Thursday, February 3rd. Don't forget about Is My Blog Burning? in the Best Meme Category! The finalists for the 2005 bloggies have been announced yesterday. I was thrilled to find out Is My Blog Burning? has been nominated as finalist in the Best Meme category. Did I say thrilled? I actually started to dance and whistle. . . at work. Good for me that my coworkers already think I'm a bit peculiar at times. I never would have thought my little original idea would have gotten that far. Thanks to all those who suggested IMBB? and an even bigger thank you to all those who have hosted or taken part to one of these events: this nomination is your nomination too. But there's more: this year the bloggies have been rocked by the food blogging community. For the first time a food blog category features in the awards. Congratulations to TastingMenu, Simply Recipes, Cooking for Engineers, The Food Section and 101 Cookbooks for their nominations. And if that wasn't enough we have three food blogs as candidates in their respective regional categories: Chocolate and Zucchini for best European, Spiceblog for best Australian and New Zelander and Noodlepie as best Asian. Kudos to all of you. And now, what are you waiting for? Go and vote for your favourites. Voting closes at 10 PM EST on January 31st.